National University of Singapore (NUS) students gathered at Yusof Ishak House for a Bible study themed The Kind King. Who is the Kind King? Who was Mephibosheth talking to? 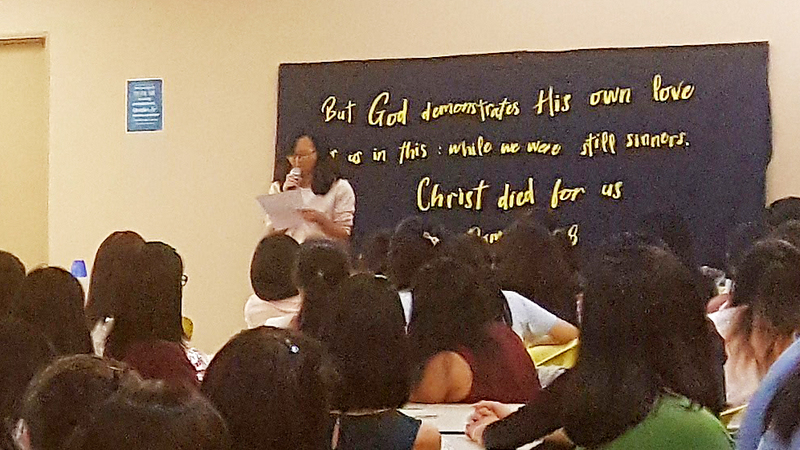 On 29 March, 125 National University of Singapore (NUS) students, including non-Christians who were open to having Bible Study, attended a Bible discussion themed The Kind King at Yusof Ishak House. It was a Good Friday outreach event organised by NUS Navigators. NUS ministry leader Mr Ryoo Jae Kwan explained that the event revolved round 2 Samuel 9 where King David showed kindness to Mephibosheth, a cripple. Through a talk he gave and group Bible discussions, participants discovered and learned about God’s mercy and kindness to sinners. Two members of NUS Navigators also shared their testimonies on how they encountered the Kind King with the audience. “In 2012, when I was an engineering freshman, I did not welcome the idea of adhering to any religion, though I believed that God existed and I wanted to know God. One day, when I was studying alone, two ladies from NUS Navigators approached me and shared about Jesus. While their sharing did not leave an impact on me, we soon met up weekly to read the Gospel of John. Initially, I was doubtful. I asked questions like, ‘As a science student, how can one believe that water can be turned into wine?’ Thankfully, these ladies answered my questions patiently and shared their thoughts. Their responses challenged me to look beyond my beliefs and to consider other possibilities. I began to appreciate the Bible and enjoyed learning more about Jesus. Almost a year later, I joined NUS Navigators for their Friday evening Bible discussion sessions. It was a refreshing experience. In spite of upcoming exams, I spent hours after each session recording my thoughts and lessons learnt. The Bible revealed my pride, selfishness and judgmental heart and I was deeply broken. Jesus said, ‘Whoever believes in the Son has eternal life, but whoever rejects the Son will not see life, for God’s wrath remains on him’ (John 3:36). I was impressed by Jesus’ boldness and great love demonstrated in his sacrificial act of dying for our sins on the cross. I wanted to turn away from my sins since I believed God had the power to save me, but I was very scared that I might make the wrong decision. God continued to pursue me. During one Bible discussion, we read in John 4 about how Jesus approaching a sinful Samaritan woman and offered her eternal life. When the woman told Jesus that she knew the Messiah was coming, Jesus declared, ‘I who speak to you am he.’ That short statement totally blew my mind. I felt as if I was the Samaritan woman and Jesus was standing right before me, speaking in a gentle but firm voice. He was telling me that I need not look further because He is the One from God whom I longed to encounter. Two weeks later, my mentor shared with me John 5:24, ‘I tell you the truth, whoever hears my word and believes him who sent me has eternal life and will not be condemned; he has crossed over from death to life.’ When she asked if I wanted to receive Jesus as my Lord and Saviour, I surrendered! Mr Chester Ho, a third-year law student, also shared how he became a Christian. “When I was very young, I briefly attended church with my family. I went church again when a Junior College friend invited me to. Although I was attentive at church, I did not really know what it meant to be a Christian. I thought it simply meant going for regular Sunday service and praying when I had a problem. My life hardly changed and eventually, I stopped going. When I started studying in NUS, a friend invited me to the NUS Navigators Welcome Tea. I felt weird being invited as I thought I was already a Christian. Nevertheless, being a supportive friend, I went. The tea marked one of the few times I really read the Bible for myself and I agreed to meet up to read the Bible again. As I read more of the Bible, I became convicted of the truths it held. I was convinced that Jesus is the Son of God. The things Jesus said and did when he was on earth were too extraordinary for him to be a mere human. The story of the stoning of the adulterous woman (see John 8:1-11) stood out in particular. When Jesus was alive, the Pharisees, who were his enemies, tried to trap him. The law then stated that any person caught in adultery must be stoned. So the Pharisees brought an adulterous woman to Jesus and asked him if she should be punished accordingly. In response, Jesus bent down and started writing on the ground with his finger. After being pestered by the Pharisees for some time, Jesus stood up and said, ‘If any one of you is without sin, let him be the first to throw a stone at her.’ Obviously, no normal person would act this way. Jesus always did the opposite of what the world expected. To me, he was either crazy or more than human. I know from other parts of the Bible that he was not crazy, so obviously he had to be something more. Although still uncertain of many things, I eventually decided to follow Jesus. I knew Jesus was my Lord and Saviour, but my faith was weak because I had never encountered him personally. So I prayed to God using Matthew 7:7-8, ‘Ask and it will be given to you; seek and you will find; knock and the door will be opened to you. For everyone who asks receives; he who seeks finds; and to him who knocks, the door will be opened.’ I prayed that He would reveal Himself to me so that my faith would be strengthened. Since then, I have been developing my relationship with God. I enjoy dwelling in His Word and learning more about the characteristics of God and His nature. In 2 Samuel 24, David sinned against God and had to be punished. God gave David three options. First, three years of famine in the land. Second, three months of fleeing from enemies while they pursued him. Or third, three days of plague in the land. King David then responded, ‘I am in deep distress. Let us fall into the hands of the Lord, for his mercy is great; but do not let me fall into the hands of men.’ True to His word, God showed mercy concerning the disaster. David knew who God was. He knew of God’s deep compassion and mercy. Do continue praying with us that all who attended this event will acknowledge Christ as King and experience the Lord’s kindness in their lives. Participants engaged in an ice-breaker game to enhance bonding in mixed groups. 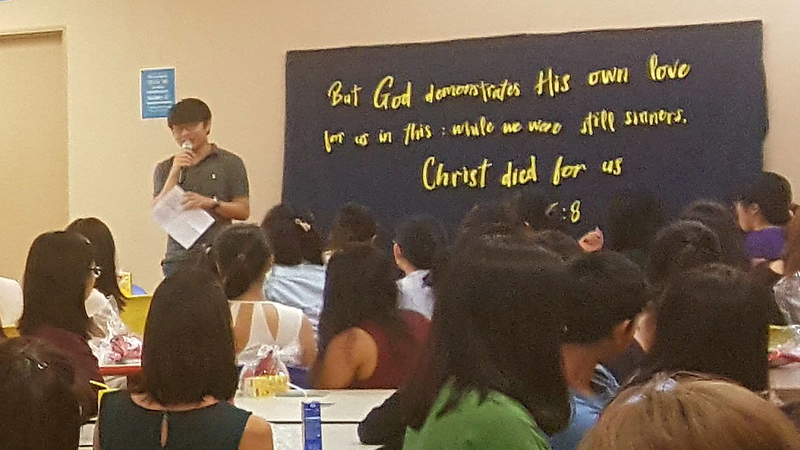 NUS students learning more about our kind King through ministry leader Jae Kwan’s sharing, testimonies and Bible discussions.